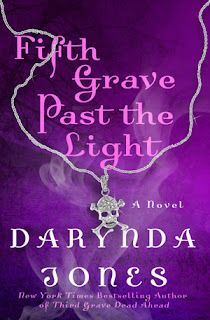 Fifth Grave Past the Light is book five in the Charley Davidson series. I'm so glad I am finally getting back into these, though I'm not sure why I stopped since they're so good. There is a ton of humor mixed into the story and it's also full of ghosts and mystery. As always, our leading lady Charley Davidson is working as a PI on a case to help the police but at the same time, she's balancing her grim reaper duties. I already know I'll be binge listening/reading this series so expect reviews for the following books up in the next week or two. We start off with Charley Davidson, a PI that is also a grim reaper. She talks to ghosts and lets them cross through her on top of helping solve cases for the local police department. It doesn't take long to dive into the mystery elements when she wakes up one morning and finds a lot of female ghosts in her apartment that all have similar appearances in how they died. She's also quickly involved in figuring out who is behind several arson incidents that have the police stumped. That isn't all the plot threads weaved into this novel, though, we also have Charley's hunky love interest, Reyes Farrow moving into the apartment next to hers. After the romance aspect building up in the past few novels, I was so happy to see it finally happen. Reyes is a lust worthy character that has always protected Charley and you can tell her cares for her so much. The tension between the two has been electric and continues to be so. 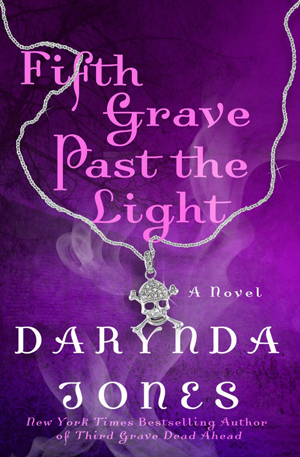 Fifth Grave Past the Light is a perfect addition to this addicting series. I can't believe I forgot how hilarious DJones' books are. Between Charley and her assistant Cookie, I was laughing in every chapter. I seriously love when humor is mixed into the story and done correctly and this is a perfect example of how it's done. The characters and plot are done well and the story arcs are weaved seamlessly. All in all, this series is perfect for fans of Urban Fantasy with ghosts and romance mixed in. I have to give major props to the narrator, Lorelei King. She really knocks these audiobooks out of the park with how she voices all the characters. You can easily distinguish between the different character voices and she brings them all to life. I've read one of these in paperback and enjoyed it but I have to highly suggest readers try the audiobook versions if you're open to that format since it adds another level to the story. Oh yes I really enjoy this series! I'm loving it as well! Oh yes, at least try one book in it!! Lorelei King is fantastic for Charley! She does the Mercy Thompson series too, but I kept hearing her as Charley and it weirded me out, haha. oh I am so so glad that you are enjoying these books darling. I do know that I want to read them so very much and very soon, this couple sounds like a blast. Oh yes, I think you'd love these Renee!! Ack you're already at 5?! I know every time I see your review I'm like yeah haven't started them yet but I want to! lol I think the audio might be it. I do love King's narration, too. haha I read several of these back to back so prepared for even more in the next few weeks :) The audiobooks are amazing, you can't go wrong with them Anna! I think I'm about the only person around who hasn't read or started this series. lol. I do need to make it to it though. lol. I hadn't forever, so glad I started it again! !